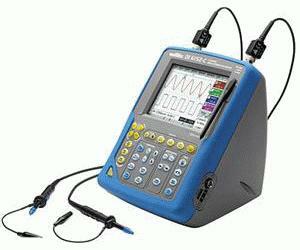 The OX 6152 oscilloscope is a "real-time" FFT analyser. With its 2 measurement channels rated 300 V CAT II, it can display up to 4 curves on screen. The new version of the OX 6152 is equipped with an SD card, increasing its storage capacity to 2 GB. Furthermore, this version benefits from a lifetime warranty. This ergonomic, compact instrument includes a built-in storage space for stowing cables or probes. On the front panel, there are 28 direct-access function keys and the "Windows-like" menus make the OX 6000 even simpler to use.